Often when we visit Kew, the kids want to head straight for Climbers and Creepers, the indoor play area, but today we wanted to get them to explore outside as we didn’t want to miss the beautiful sunshine! Bring on the treasure hunt. To ensure at least one child was onside, munchkin and I created the sheets together. She helped to choose pictures for the sheets, which also provided us with another activity, and we personalised each one with the kids’ names and headed to Kew. First we popped to the Princess Diana Conservatory and looked at plants and fish – which promted comments such as “the crabs are behind the glass” from the munchkin and “can I put my finger in the water with the piranha” from bear-cub! Then we headed outside for the treasure hunt. One sheet each (see below for link to printable sheet), one bag each and we Mummies were able to sit chatting while toddlers ran off together, (sometimes even holding hands and often calling to each other, searching for their treasure!) When they got confused, they’d head back to us and we would look in their bags, and chat with them about what they’d already found and then direct them to a good area to look for the next thing. It really didn’t take much effort on our part and it extended our time for chatting and catching up no end. 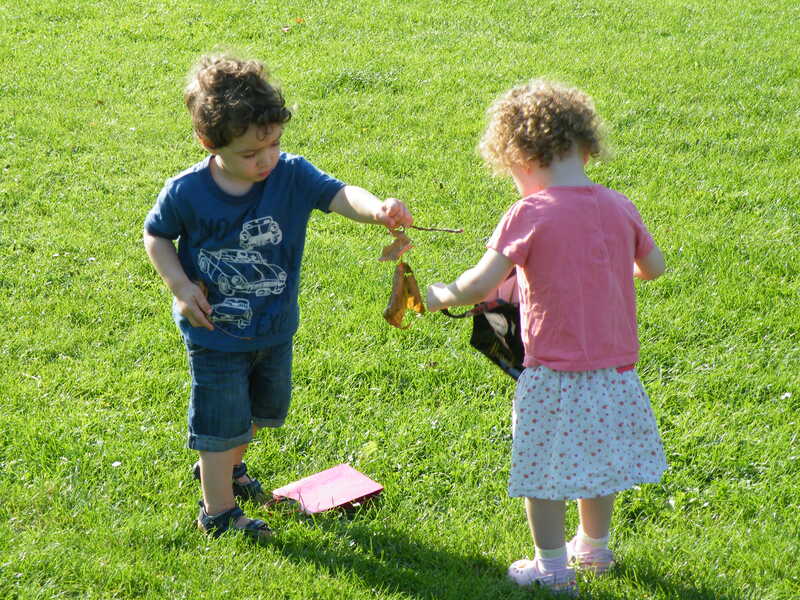 After the kids had completed their treasure hunt, it was time for a snack then off to look at the ducks, but throughout the little treasure bags were gripped tightly in their hands and then after a picnic lunch they headed off to find their own treasure, proudly bringing back fir-cones! Back to nature, little ‘uns! 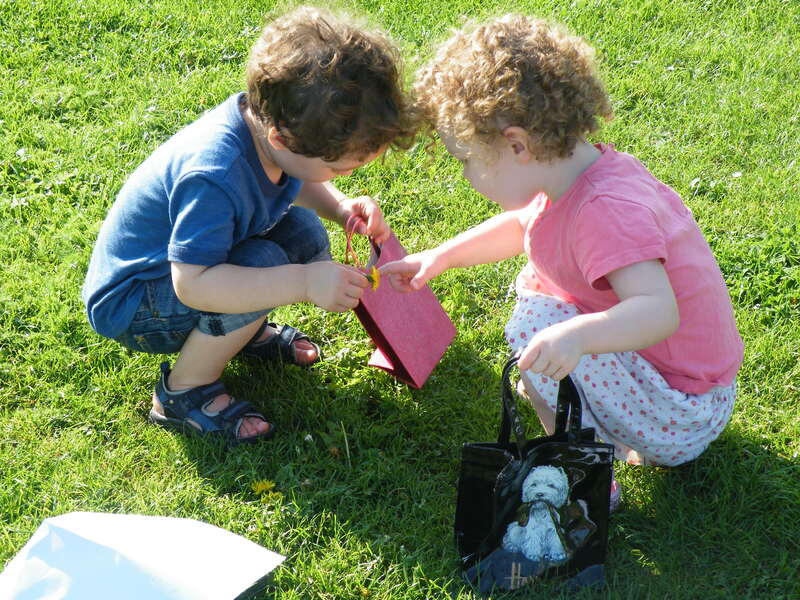 Did you have a go at the treasure hunt? If so, let us know how it went. If not, why not print one off today and have a go? This entry was posted in Activities, Fun things to do, Toddlers and tagged family fun, Free activity sheet, Preschooler, Toddler. How do you get a two-year-old, who is perfectly capable of walking, to go where you want at a speed that isn’t so painfully slow you want to cry, without demanding to be carried after about 2 minutes? If you already have this cracked then I worship you! For me, a walk to the shops, the library or even the park, can have me breathing deeply and counting to ten rather too often. I regularly resort to the buggy for journeys, despite knowing that she can walk the few 100 yards, just so that I don’t have to a) chase her the wrong way down the street, b) drag her along like a sullen teenager or c) carry her! The other day I hit upon an idea, however, and it was so simple…we did a treasure hunt. I printed off an A4 sheet with her name at the top (that alone was exciting for the munchkin!) 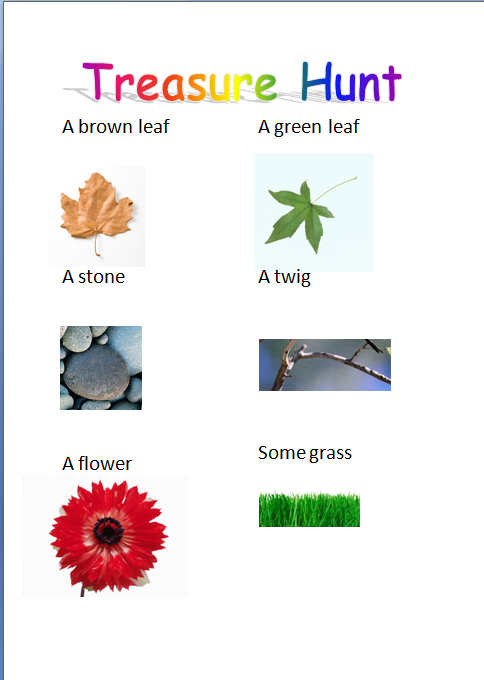 and six pictures of things to find: a brown leaf, a green leaf, a stick etc. We headed out with said list, a bag to collect things in an a smiling, excited daughter. She walked all the way to the park, gleefully searching for stones and grass. She didn’t say she wanted to be carried. She uncomplainingly held my hand across the roads and she went the right way at a reasonable speed. Result! She even came back in the same way looking for the last thing. One word of warning though…I printed a red flower. Red flowers are not often found wild at this time of year. Darling daughter would not pick a different coloured flower, despite my protestations that I had only meant a flower, and the red was just for illustrative purposes, so if you want your child to be able to achieve the treasure hunt (without climbing over people’s garden walls…) consider the colour of flower! This entry was posted in Activities, Toddlers and tagged family fun, Free activity sheet, Preschooler, Toddler. So it was going to happen at some point – last night my two worlds (or maybe I should say two of my worlds) collided in public view! 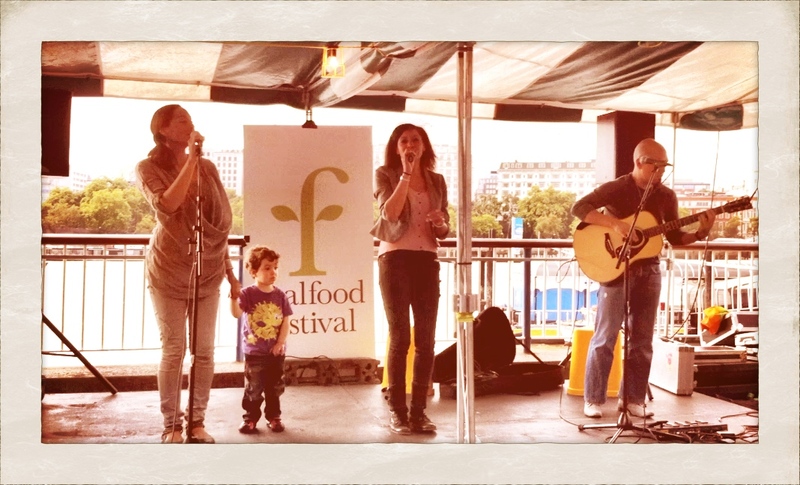 I’m a singer as well as a mum and we had a gig at the ‘Real Food Harvest Festival’ outside the South Bank Centre. The Bear-cub is usually in bed when I have a gig and mostly I arrive late for sound check having done make-up in the car on the way, squeezed in some ridiculously high-heels, and hope that none of the audience would guess less than an hour before I was singing ‘Wheels-on-the-bus’ and bargaining with my two-year old to get out of the bath! However, on this occasion the gig was in the late afternoon and on the beautiful South Bank which I love both vibe and view. So with toddler in tow I thought it would be nice for him to see mummy sing. We’d been at a wedding the day before and he’d danced the night away in his kilt (a whole other blog!) so I’d assumed/hoped he’d do the same while we performed. But, I should have remembered the rule – if you plan your day and especially for your little one to do something in particular they will of course sense it and do the complete opposite. What’s it called again? Ah, yes: Sod’s Law!!!!! It had already been a crazy journey on the over-ground train to Waterloo with said toddler landing his plane on various strangers heads while mummy attempted to apply make up in order to make illusion/transformation from mum to professional singer! I’d already forgotten my Mac and Clinique make-up and all I could find was ‘Hello Kitty’ make-up – yes really – Hello Kitty make-up at a professional gig! We arrived early and Bear-cub consumed an entire posh cup cake, ice cream and falafel in 15 minutes flat and all seemed to be going to plan. Then it was our turn to perform and I placed Bear-cub with a friend and went to the stage informing friend casually over my shoulder, as I quickened my step, ‘He’ll be fine, he’ll start dancing once the music starts’. But no, how silly of me to think the juggling balls could stay in the air and impress/convince the general public that I was the ultimate literal all-singing-all-dancing-modern-mum! Bear-cub instantly decided to have a meltdown screaming ‘I want to sing on stage with you mummy!’ and I knew it was one of those that could not be bargained away – besides I’d used up all my trump cards with cupcake and ice-cream all ready administered! So the only option was to relent to bear-cub’s request and I performed a 40-minute set with my band holding my 2-year old’s hand on stage throughout!!! To say I was slightly distracted during the show would be an understatement and at points I wondered if I was even singing in tune let alone singing the right words. Bear-cub however, was in his element twisting and gyrating like a mini Justin (Timberlake, not Bieber or Fletcher) and we just about pulled it off. There were of course a few a hairy moments when Bear-cub started holding his willy and I was expecting a puddle to appear on the stage at any moment. But, no such disaster happened – I think he may have just been doing a Michael Jackson impression! Another moment was when Bear-Cub decided to break-dance during the last track and attempt some kind of head-spin (no word of a lie) but I managed to grab the microphone stand, keep it from falling and keep smiling as if it was so sweet and planned and not stressful in the slightest. What was interesting was seeing people’s reactions when they gathered round the stage to listen to us and spotted a pint-sized member of the group. Some would laugh and point, some would push their kids to the front for a dance and some would frown. My friend in the audience afterwards told me how she overheard one mum tut and comment to her husband how awful it was that I was ‘making’ my child stand on stage with me during a gig!! This mummy was either jealous, has a child who willingly complies to her every wish or simply has no sympathy for single parents who are still trying to live their dreams and still be a great mum – oh well! I still managed to get Bear-Cub home and in bed for 8pm, collapse on the sofa and celebrate with a rum and a coke. The collision of two worlds, rather than being a disaster of global proportions, was merely unexpected fireworks that made some beautiful colours in my view – at least that’s what I’m telling myself! The Bear-cub hogging the limelight! 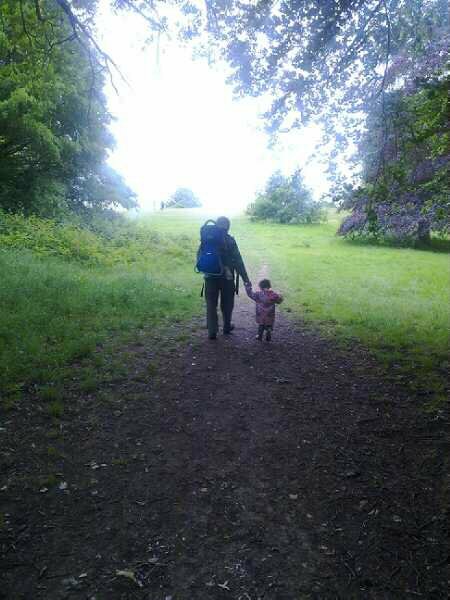 This entry was posted in Uncategorized and tagged balancing parenthood, Humour, music, toddler tantrums. We got round to watching this week’s Doctor Who on Sunday evening. After a hectic, but fun family Sunday with old friends, which entailed stopping toddlers from fighting and trying to make them eat, we settled in for an iPlayer moment and a hot chocolate. (It’s just so rock and roll in our household!). I was trying not to keeping thinking about morethanamumblog and just to relax and enjoy sitting on the sofa with the long-suffering husband, but even Doctor Who conspired to trigger the mummy blogger in me and I had to run and get my new notepad (more of that in a later blog!) and make few notes. If anyone else saw the episode you are likely to realise that it was pretty early on when the inspiration struck. If you’re not a Who fan, then just a brief outline. James Cordon helps the Doctor save the world, but despite his apparently poor parenting skills at the beginning, it is his love (the Doctor explains it in a much more scientific manner at the end, but resorts back to love for us mere humans to understand) for his son which saves the day. The sight of James Cordon, surrounded by mess, desperately trying to persuade everyone that he was “coping” made me remember those first few days, weeks, months with a new baby. “You read all the books and they tell you you’ll know what to do, it’ll be fine if you follow your instincts. I have no instincts.” Says Cordon, looking unkempt and at the end of his tether. Brilliant; it must have been written by a parent. No matter how much of an earth mother (or father) you may be, we all have those days. Those days when we wish we were like the Doctor and could speak baby, but know full well that we can’t. Those days when it feels like you know nothing about parenting, and if the baby could talk it wouldn’t tell you what it needed but that you are a crummy parent. But, take heart; we do all have those days! One thing I used to do early on, and still do sometimes, was Google the issue. Often it wasn’t finding a solution that made me feel better. One thing I’ve learnt about parenting over the last 30 months (not long, but long enough!) is that there rarely is one easy solution. No matter what parenting manuals promise, every baby is different; every parent is different; every family is different. Some things work for some people. If they don’t work for you, you can bet your bottom dollar that’s not because you’re any different to a massive chunk of the population, it’s just because parenting doesn’t come in a one-size-fits all mould. Although I may have Googled to try and find the solution to various problems and even tried many of the ideas which were sold as the cure, it was finding out that I wasn’t the only Mummy struggling with a particular issue that made me feel better; realising that I was no different to many other Mums and Dads; all of us just muddling along. So, my advice if you’re worried about something is Google it, by all means, but when it’s really getting to you, take a leaf from the Doctor: put your finger to your lips and ‘shhh’ all thoughts of yourself as a bad parent from your head. We all get it wrong some of the time, but (cue cheesy comment – sick bags ready) it is the fact that you love your child that it will all come out in the wash. Oh, and sometimes it is easier once they learn to talk. At least then they can tell you what’s wrong…even if you do still have to tell them it’s not allowed! This entry was posted in Advice, Doctor Who, We all make mistakes and tagged Doctor Who, Mummy blogging, New Mummy, Parenting. This entry was posted in SilentSunday and tagged silentsunday. Stanley is a plastic money box that Nanny brought her a few weekends ago. Nanny works in a well-known bank (as they say on the Beeb!) and the plastic money box is in the shape of the aforementioned ‘Stanley’ the dog, which is in the adverts at the moment. The money box caused some hilarity (and some squirming from me) when, the munchkin went round asking all the guests in our house for “some coins for my moneybox”. That’s OK when it’s the people who brought the moneybox, and even Mummy and Daddy, but when she started pouncing on friends we had staying and saying, “No, I want a silver one!” it got a touch embarrassing! I popped my head around the door to see the munchkin emptying coins, one by one from my purse into her moneybox. She looked at me and in all innocence said, “Look Mummy, I’ve found some real money for my money box”! If this two and a half, what hope is there?! This entry was posted in Humour, Toddlers and tagged Humour, Toddler, You've got to laugh. I love my mother. She is my best-friend and confidante. She is the woman who brought me up. She is an excellent Grandmother and a fantastic emergency, child-minder. I value her opinions and trust her judgement… most of the time! Recently, however, there has been one thing I have to disagree with her about and that’s the terrible-twos. The munchin is not the worst behaved toddler I know by a long stretch, and I don’t think that anyone else would say that she is either, but she is two and she does have her moments. I have made comment about those moments to Mum on the phone on a number of occasions. I am usually at home on my own with her when she throws a real wobbler (thank goodness still appears to happen mainly in the house) and I often feel the need to off load. Who better to call in the middle of the day and let off steam to than your mother? Well last time I called and made comment about the ‘terrible-twos’ and a small barney that myself and munchkin had had over something trivial, mother decided that the best thing to do was tell me how she and her friends had all been discussing this issue and had come to the conclusion that it must be modern parenting which caused this, as none of them had ever had a problem with their children. Way to make me feel better Mum! We chatted for a while (with me no doubt sounding a little frosty) about why I didn’t think my parenting had created some sort of monster-child; how I wasn’t parenting all that differently to her and that one off refusals from a toddler are developmentally normal, but still she said, “I can see what you mean, but I think it’s just like stress, neither of them really existed in the past”! I have decided that rather than falling out with my Mum on this one, (and I’m not even getting into the debate about ‘stress’!) I shall instead take a positive message from my mother and her friends’ rose-tinted spectacles. No matter how awful those tantrums seem now, the memory of them must fade to nothing over the years. What other explanation could there be for an entire generation of angel-toddlers?! This entry was posted in Dealing with other people's advice!, Toddlers and tagged Advice, Humour, Toddler, You've got to laugh.